It's said often that where there is smoke, there is fire. In early July, I tried to read the smoke signals emanating from Brizzly co-founder Chris Wetherell and investor Mike Hirshland on Twitter about a myterious "buyout offer" and "legalese", incorrectly guessing the social media client was going to be joining up with Foursquare. It turns out that my hunch correctly had sniffed out fire, but completely whiffed on the suitor. Instead of a 2010-era nimble startup, Brizzly's acquirer is the 1990s-era AOL, who can now be confirmed is picking up Thing Labs (makers of Brizzly), including the company's well-respected small team, and all company assets, from the Brizzly Web and iPhone client, the Brizzly Guide, the URL shortener, and even its colorful mascot, Phineas T. Brizzly the bear. The acquisition is said to be at $18 million guaranteed, with potential earnouts to near $30 million. The company's founders, Jason Shellen and Chris Wetherell will be running AOL Instant Messenger and the company's lifestream service - giving the pair high profile roles that could impact millions of users immediately. It was this acquirer that set off the curious tweets in July, putting the team in an odd position of having to deny they were being sold to Foursquare. What was not said, however, was that no sale was taking place, period - because, indeed, those gears had started to turn at an Old Media company speed. That Thing Labs would be the target of potential M&A activity is no surprise. 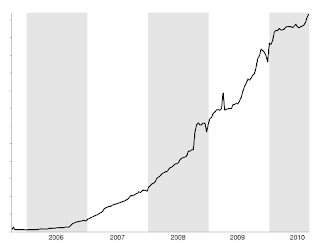 Shellen and Wetherell are given a good amount of credit for their work at Google on Reader and Blogger, with Shellen's work dating prior to Google's acquisition of the Ev Williams-co-founded Pyra Labs back in 2003. The team is very sharp, and had created not just "yet another" Twitter client, but one that had deep ties into the social graph across multiple networks, and a lightly heralded, but very cool, collaboration system called Picnics. It's Picnics that has AOL ready to take Brizzly out for more than a mere lunch. The combination of a top-notch team and intriguing technology saw Thing Labs enter into potential acquisition talks with multiple partners this summer, some who eventually found the product not to be a perfect fit with their portfolio, and still others, who were rejected by the company's team out of fear they would be part of a soulless "talent buy" who would take Brizzly off the map. Meanwhile, as these distractions emerged, the company retained the opportunity to initiate the raise of a Series B round of funding, following their $600k Series A round completed in late 2009. Other potential acquirers included Yahoo! and Google, both of which Thing Labs was said to have turned down. Yet the somewhat unlikely partner of AOL, a media giant with a damaged brand, especially in the mind of Silicon Valley and startup entrepreneurs more specifically, has emerged as the victorious buyer, following due diligence not just from their team to see if Thing Labs would be a solid complement to their still-popular with millions of people Instant Messenger client, but also from the Thing Labs developers, who wanted to be sure of the quality of AOL's development team, especially as some of them had experienced less than satisfactory relationships with younger gung-ho teams at large Web services previously in their career. As has been reported by AOL-watchers like Kara Swisher and Mike Arrington over the last couple years, the company is trying to gain a respectable presence in Silicon Valley, under the leadership of former Googler Tim Armstrong. But with company headquarters in Dulles, Virginia, and much of the leadership in New York, AOL is struggling to attract and retain top talent in the Bay Area. The prospect of being acquired by a Web 1.0 property like AOL initially tugged at Thing Labs' leadership, while recognizing the financial benefits for the company's 7 employees, who for the most part, excluding the cofounders, could be seeing a tax bracket upgrade after this transaction settles. While the deal is officially being reported as $18 million, the contract calls for significant earn-out clauses, which could drive the eventual price up to as much as $30 million, serving to provide Golden Handcuffs to the team's talent and locking them up to the company that once flooded the USPS with floppy disks promising free hours each month of dial-up service and a walled garden. 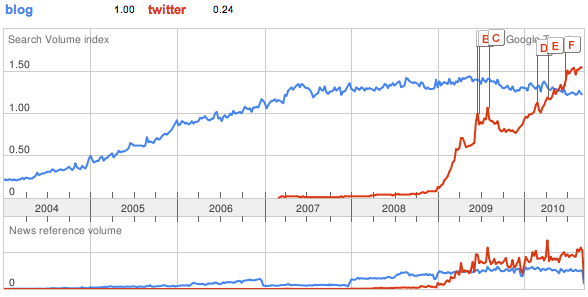 AOL is obviously on an acquisition spree, rivaling only Google in terms of buzz in the last few months. The Thing Labs acquisition follows news today that the company also picked up TechCrunch itself, bringing the tech blog titan into the content-focused Web pioneer. The company also purchased 5 min yesterday. Interestingly, with the TechCrunch acquisition, AOL has Crunchbase, and with the Thing Labs acquisition, AOL also has the Brizzly Guide - a more real-time directory, edited by users. The two could be complimentary, separate or one could be retired. It's said the Brizzly Guide will be used for real-time home page news curation. Additionally, the work with Foursquare turned out not to be completely empty after all. While not part of the M&A transaction, Brizzly announced integration with Foursquare overnight, letting you view checkins alongside updates on Twitter and Facebook in the service. As a sidenote, this continues the unique career path of Thing Labs' Ben Darnell, who in the space of just a little over a year, has worked at Google Reader, then FriendFeed, then Facebook, then Thing Labs and now, AOL. But this time, he probably made a little bit of money. Ben has recently been known for his contributions and leadership to the Tornado Web server project. AOL might be seen as old tech, but it picked up some serious new media leadership here. Official word of the deal should break soon. Social Layers or Networks... Is There Room for More? Sometimes, it seems the phenomenal success and user growth seen by Facebook and Twitter in the last few years has boxed in what we accept as a bonafide social network - as we early adopters and tech press absorb potential challengers like chum and digest them quickly, mocking their attempts as feeble, and their traction as futile. For some, Facebook and Twitter, despite their faults, are the end all and be all - and it matters not if other products have more features or innovation, because in the end, he with the numbers wins, and it seems they've got all the numbers. In the meantime, recent comments from CEO Eric Schmidt of Google to social layers being part of whatever the company has planned for what's largely been dubbed as Google Me have people saying a thin layer of social spread like a veneer over the company's many products just won't be enough to challenge a behemoth like Facebook - yet we see social elements being added to just about everything, from our e-mail clients to our music players, our photo editors and our video games. The world is going social, whether it's little bit by little bit or in an all-in gamble to change the world. It's simply a matter of perception as to what is a feature and what is a network, and if users are willing to give the old college try to networks that aren't from Palo Alto and San Francisco proper. Just take a look at Apple's Ping, within iTunes. Is that a network, or a social layer grafted on an existing service? What about Spotify Social? Is that the same thing as Ping, or is that simply a service that integrated with Facebook - not a network on its own? Does a social network require a unique user name and password and its own social graph to be a network? What about Google Buzz? Is that a social network, or a social layer inside of Gmail? And if that's a network, certainly one must consider the social elements of Google Reader as a layer and not a new network on its own, right? And just where does this leave other innovative social services (that's a safe word), including Amplify, Cliqset, Quora, GetGlue, Plancast? Boxee? Is Foursquare a social network? And let's not forget the classics that have been here for a while, even if you're not talking about them... like MySpace. LinkedIn. FriendFeed. Orkut. The list could go on for a while. Additionally, it is interesting to see how the services themselves perceive their place in the world - if they are networks, layers, or features. "If you think about it, there's always been a big social network underlying Gmail. Buzz brings this network to the surface by automatically setting you up to follow the people you email and chat with the most." 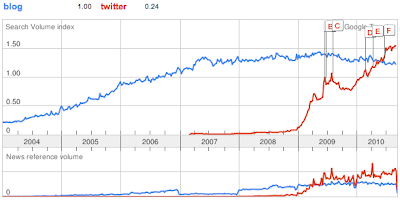 So it sounds like, to Google, Gmail is the social network, and Buzz is the presentation of that network. Note this is not how they presented social features in Google Reader, when they added comments in March 2009 or when they added friend management in August of 2008. Neither blog post even mentioned the word social. So the ability to make friends, to add likes and comments, that was not a new network, but instead new features on an existing service - albeit one that integrates very well with Buzz, which came afterward. In contrast, Apple Ping describes itself directly as "A Social Network for Music", while just last week, Twitter says it is not a social network at all, but instead a media company. In May, I said to make a choice to your mobile phone platform, you should look to the core. For Blackberry, that's e-mail, for Apple it is iTunes, and for Google, it is the Internet. Not surprisingly, the latter pair's social networking aspirations are starting there. Apple has shoehorned a social layer into iTunes and called it a social network, much like Google did with Buzz and Gmail. Both companies are rallying users to spend more time in their assumed strengths. It makes good sense. Now, with the thought of Google adding social elements to everything, be it through layers, or widgets... or something, you can see the idea. Share everything. Like things. Link things. Facebook wants to own the "like-o-sphere" and capture what pages you like everywhere on the Web. Why would Google want them to have that alone? Of course they wouldn't. The tech rumor mill is seemingly in wait and see mode over what they hope would be a full-on assault against Facebook from Google. Is it because they want an alternative to Facebook, and would literally leave the site for something else? I doubt it. I think it is as much because they want to see a fight. They want to cover a fight, and to declare somebody the winner and somebody a loser. It's clear, at least to me, most people aren't even spending the time to establish serious use on secondary platforms - platforms with elements similar to Facebook and Twitter that offer sharing and connections and liking and discussion - like Amplify, who wants to break through the 140 character barrier to have real communications, or like Cliqset, who wants to enable discussions to flow in and out of the network, no matter the origin, or still again, like Cinchcast, which is the easiest way to make a social network around audio podcasts on the go. There's a like button in my iTunes now. I didn't ask for it. I don't even use iTunes much any more, now that I'm addicted to Spotify. There's a like button in my Google Reader. There are like buttons in my Facebook and my FriendFeed, and my LinkedIn too. These are social elements to existing networks. But think about who could turn this all upside down - the operating system guys and the browser guys. Guess what? They're one and the same now. Google has an OS and a browser. Apple has an OS and a browser. Microsoft has an OS and a browser. Only Firefox seems a little out of luck. Why wouldn't Google or Apple find a way to make the browser social, through a social layer, and make the entire Web their oyster? You wouldn't even have to make one more login with yet one more password to remember. Let's not get too caught up on what's a network and what's not... what's a layer and what's not.... what's a feature and what's not. The real question is if the big guys are going to deliver tools that bring us real tangible benefits, or if there will ever be a small challenger that gets our attention so strongly that we really take the time to use it and get it right. For now, I think the alternatives to Facebook and Twitter are in the small niches. They are in Fabulis for the gay community, in SportsBlogNation for the jocks and fans, and in Reddit or Digg or Slashdot or Hacker News for the nerds. Being social doesn't have to be in a network. It's everywhere. It is already a feature, layered into all we do. At the end of 2009, Mobile Roadie made a big splash at Le Web for the company's do it yourself iPhone application builder. The app, for about $500, could create a customized application for individuals, and has seen strong traction in the entertainment space for artists including Taylor Swift and Madonna. 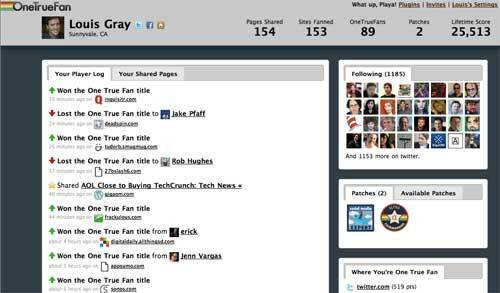 It's also the platform used for iPhone apps featuring Chris Brogan and Brian Solis. I even paid for one, but haven't taken the time to build it out. But today, I tried a cheaper alternative (up front, if not in the long run) that already has a mobile URL for me, with many of the same features. The new platform is called iSites. iSites bills itself as being able to design once and publish on multiple mobile platforms - meaning you can get published on both the iTunes Store and the Android Market. The "Instant App" feature requires no approval from Apple and is $10 a month afterward, while official apps on both platforms run at $50 a month - with the option to monetize with AdMob, if you are interested. 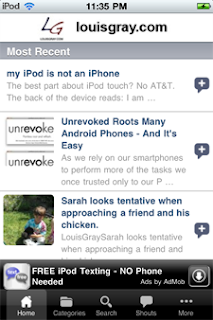 Like MobileRoadie, iSites (not to be confused with iSight cameras) prompts you to enter a number of public RSS feeds aligned with your blog, your photos, your tweets or your YouTube videos, and to label them in your app. You can create a custom splash page, and in the space of less than an hour, you can have a customized URL to point people to all your updates. For example, mine is at louisgray.isites.us, which looks a lot better on an iPod Touch or iPhone - and in weeks will support iPad as well. 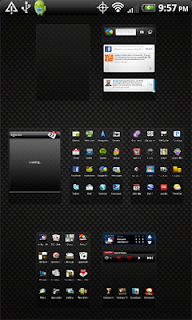 The system autodetects the mobile browser, and prompts visitors to add the Web app to their home screen. It works - and does so almost immediately - even if it is not flashy, giving you an option to keep friends, family and fans updated on all your activities with a single app. I spoke with Raju Sagiraju, the cofounder of iSites, on Thursday, who explained that the company gets around the rigorous app store process thanks to the creation of an HTML 5 capable Web app. He said, in contrast to Mobile Roadie's focus on musicians, iSites is focused on newspaper sites, bloggers and others looking for vanity apps in the consumer space. The team is seven people large, based in Mountain View and just raised $1 million to get off the ground. As they grow, if you can't get enough Louis Gray from here, you can grab my app at louisgray.isites.us. I'll be tweaking it over time to make it stronger. You can make your own app at iSites.us. As we rely on our smartphones to perform more of the tasks we once trusted only to our PCs, we expect them to be fully capable - and are impatient when we run into limits that get in the way of us trying to accomplish something that should be simple. But limits are often in place, by hardware manufacturers, carriers and operating system developers, regardless of your preferred platform, that can slow you down. Luckily, smart coders are often ready with solutions that get around pesky manufacturer suggestions and vanilla installs to bring our smartphones to their full potential. This movement, most famously spurred on by iPhone jailbreakers on the Apple platform lives on in Android, helping technology n00bs like me give my phone root access without having to learn new computer languages. While I very publicly switched away from iPhone to Android earlier this summer, the platform occasionally has its annoyances. They all do. One of the most glaring is how Android (even with 2.2) approaches screenshots. While on the iPhone, screenshots are simple, and two thumbpresses away, Android requires third party software, and the third party software requires the device to be rooted. In theory, it's all in the name of security, but it's a royal pain for a blogger who likes to show what apps I am actually using in articles that cover Android. Root is also required for more advanced edits of the phone's default actions, such as getting out of the bloated HTC Sense UI and to stock Android. I had previously solved this shortly after getting my HTC EVO at Google I/O, but a subsequent over the air (OTA) update from HTC wiped out my root access, and left me with Sense again (and no screenshots)... for months. Phooey. 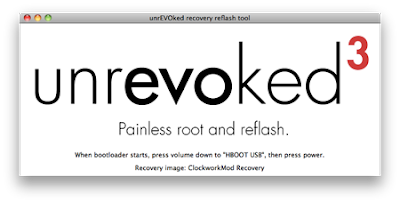 But a team led by Matt Mastracci of DotSpots (@mmastrac) has released a simple tool called Unrevoked, which works for Mac, Linux and Windows, and makes rooting your device - forever - a snap. Just go to http://unrevoked.com/, choose your Android phone model, download the software, and follow the simple instructions. Unrevoked, as the team reminds us on their site on the Electronic Frontier Foundation (EFF), says they want to "make it legally possible for people like us to reverse engineer and run code on products that we own". That's been a big sore spot for those jailbreaking the iPhone, and rings true again for those who hear about the openness of Android, only to find similar limits in place. As you can expect, the Unrevoked team is in something of a tug of war, looking to stay ahead of the device makers and their future OTA updates. But if you watch their Twitter account (@unrevoked) you can see guidance on how to keep the upgrades from the carrier and handset developers, but maintain the opportunity to keep the phone fully rooted and fully capable. Even if you don't have a CS degree (and I don't), you can run Unrevoked. 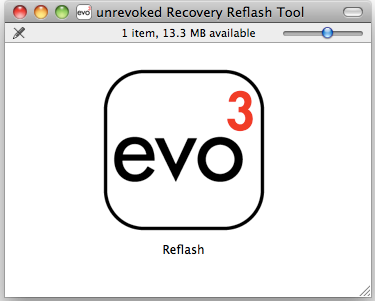 Find it at http://unrevoked.com/. If one had 140 characters for every blog post that has been written covering every nuance of the new Twitter layout since its debut last week, it would likely rival Wikipedia for sheer size, and its content would trail it in pure excitement. And as the new Twitter (affectionally tagged as #NewTwitter) rolls out to the drooling masses in coming weeks, some who feel they have mastered the microblogging platform will find that amidst all the new screen real estate and widgetry, they've lost a big chunk of their ability to personalize their identity on the site - as one of the more popular grassroots movements, customization of one's background with contact information, is practically eliminated. For nearly all entry level to mid-level social media experts, a key aspect of their Twitter customization repertoire has been the modifying of one's page background to serve as an informal calling card. Individuals and brands alike (myself included) often post e-mail addresses, provide more detailed biographical information, and instruct people on what they can expect from their tweets. Loic Le Meur (@loic) uses it to show his presence on YouTube, Facebook and Seesmic. 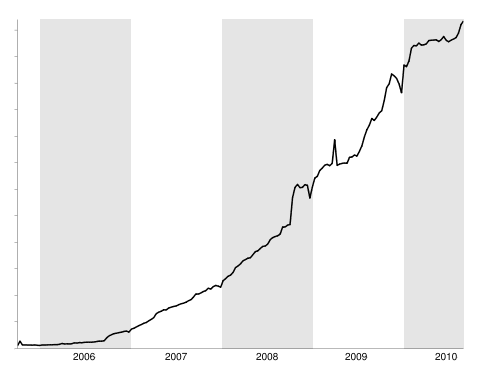 Chris Brogan (@chrisbrogan) highlights his work and book sales. Brian Solis (@briansolis) provides his e-mail address, Facebook URL and Web site. It's practically expected. Google shows 36,000 results with the phrase to "customize your twitter background" and sites like Mashable have devoted entire tutorials on how to create custom backgrounds that offer personalization, expression and contact information. But the "New Twitter" does away with almost all that space. Chris Brogan is reduced to a "Ch". Loic's background provides no information at all, and yes, mine has to be redrawn as well - assuming I'll make it a priority. It's all in the name of progress - cutting out personalization in exchange for new features - including the much-discussed multimedia in the stream and right hand pane, which may some day serve as a good place for Twitter's monetization efforts. The result is not dramatic, in theory. Individual tweets within the new Twitter are centered (as before) and display more of the traditional background. (Like this one) One could also double down on their avatar and simple 160 character description in the bio, considering that "good enough", as Twitter again does what I think is well-intended, but catches some users by surprise - opting to do what they believe is best, even if it runs contrary to public opinion. When called on the carpet by VentureBeat writer Owen Thomas (@owenthomas) about the changes, designer Doug Bowman (@stop) said the act of putting text in the background image had never been supported. Owen pointed to other user-generated behavior, including retweets, @replies and hashtags as good examples that users know best, but it doesn't seem there will be a rollback of the idea. The New Twitter also reduces the options for some services to market themselves. Instead of seeing "From TweetDeck", "From Tweetie for Mac", "From Seesmic for Android" and so on down the line, the New Twitter no longer displays Tweet sources. I assume this is to reduce confusion from new users, and to focus on the content of the tweet instead of its source, but again, Twitter's full motives cannot be divined. Meanwhile, as with the background issue, the source displays itself in full on the direct tweet page. Since the launch of "New Twitter", I have already seen friends and businesses ask for the right guidance in personalizing their Twitter experience, and finding their old approach to page backgrounds is going to be evaporated in coming weeks as the new site rolls out. With the many features and functionality, it comes at a small price. I eagerly await 36,000 more results in Google telling us how we all need to adjust to single-word skinny backgrounds (align left) to tell our story. Mine just might drop my e-mail and blog URL, and the rest will all have to be found somewhere else - say... Google. Or Facebook. But not Twitter. 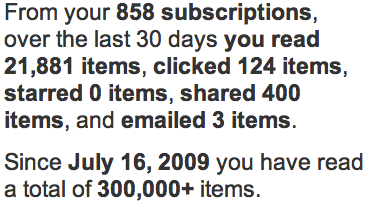 The last few days in my RSS readers have had me feeling like we are in the middle of blog post reruns - the best of 2009 edition. Within the bolus of hundreds of new items welcoming my every visit to Google Reader, the debate flared up again this week as to whether the very act of consuming content within an RSS reader was a dying one. For the dissenters, the growth of social sites like Twitter and Facebook, and the announced closure of Bloglines is enough to say the tide has turned. Meanwhile, the application developers and their active users swear any rumored decrease is false, and the RSS reader remains one of the most efficient ways to consume content. The premise of the entire debate is broken. These are tools, and it is not a zero sum game. In the same time as we have seen a general falling away of activity with Bloglines, once the most heralded competitor to Google Reader, we have also seen considerable innovation in the RSS Reader space. 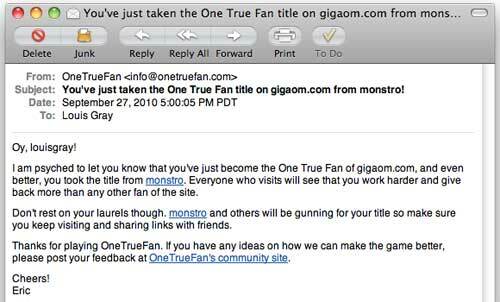 In 2008, we saw the debut of Feedly, a magazine-style Web-based RSS reader - and that service now sees hundreds of thousands of unique visitors per month. 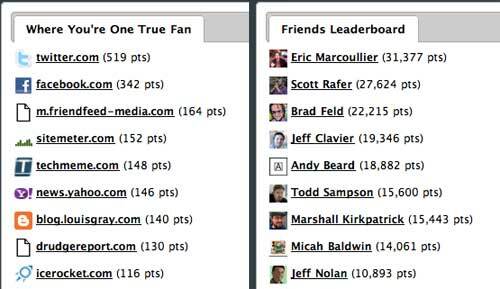 In 2009, we saw the addition of Lazyfeed and smart RSS-based filters. 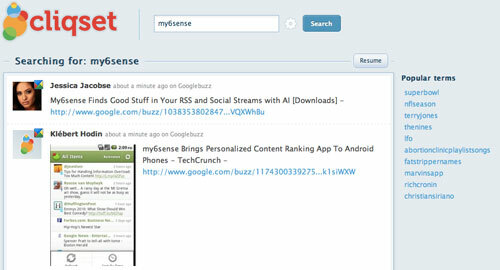 In 2010, Pulse debuted on the iPad, iPhone and Android and is selling many licenses to feed-hungry mobile fans. On the Web side, there is also continued development from edge cases including NewsBlur and Punching Soup. 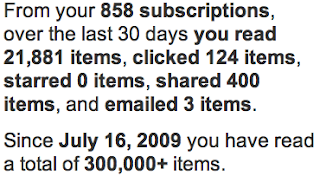 Meanwhile, Google Reader reports usage is growing, and never stopped. Those who have turned their backs on RSS readers often subscribe to the theory that news will find them no matter what, and to some degree, that is of course true. Twitter's press conference from Tuesday said 90 million tweets are being posted daily, and a full 25 percent of those tweets contain links - so there are more than 20 million links being thrown into the service, at the rate of more than 15,000 per minute. Subscribe to any prolific link sharers or news sources, and you're bound to get the opportunity to get some links thrown your way, and the news will find you. Twitter has become such a force for news dissemination that the concept of discovering Tweets that "only contain links" and hiding the more mundane status updates is becoming commonplace. 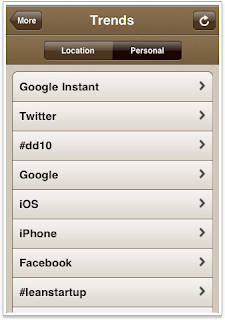 Even the new search built into Twitter's updated interface allows the option to search "Tweets With Links". This is a great step forward, making Twitter even more similar to RSS for full content. The long-held advantages of RSS readers over Twitter are still there. You pick your sources, and you can come to a "full" in box of items at your leisure. Almost all feeds are full feeds, without truncation, something impossible to do in 140 characters. But new apps are not just discovering tweets with links, but some are unpacking the URLs in advance of your clicking, so you can get a full preview of the story to indicate in more detail if it will be of your interest. The New Twitter Searches Tweets With Links - Cool! For me, one of the major reasons I can not foresee walking away from an RSS reader in the near future is how closely tied into my own behavior something like Google Reader is for the act of curating a shared items feed (or link blog). My shared items play a key component of my downstream activity on social networks like Google Buzz and FriendFeed, and these shared items also hit Twitter on a dedicated account (@lgstream). If I turned my back on the thousands of people who have connected to this shared feed, I would need to restart it in a new place, and see if I could manipulate Twitter lists to be as strongly organized as my RSS folders. So long as I want to play the role of human curator, this will be a big activity for me, and RSS is the foundation for this activity. On the iPad, Flipboard is a good solution for extracting news from Twitter and Facebook in a visually appealing way, with each link displaying much of the article underneath (via RSS). On the iPhone or Android, my6sense offers a mixed view, whereby I can see updates from Twitter, Facebook, Google Buzz and RSS all in one place, agnostic to the stream. This is a great equalizer, putting each source on an even playing field, not forcing me to pick a favorite. Debates over tools, applications and personal consumption preferences are short-lived, and not very useful outside of a small niche of update obsessed infovores. The tools we use today are significantly evolved - and much faster, with upgrades from the world of real-time and impact from our social streams. We are consuming more information from more sources than ever, and we are doing it on more mobile devices. The important focus is to make sure that we are able to ensure the information finds us wherever we are - at the right time, at the right speed, and from a trusted source. For many people today, RSS is the best tool for the job, one with reduced noise, and personal focus. For others, the process of serendipity, personality and discovery trumps the reader experience and they are moving elsewhere. But the debate is not a debate. It is evolution. One company's closure when more and more are getting in the game doesn't indicate the closure of the market, but instead, a milestone. Disclosures: I am VP of Marketing at my6sense. Google Reader, Flipboard, Feedly and Pulse are players in the information consumption and sharing space, and may be considered competitors or potential partners now or in the future. Through my work with Paladin Advisors Group, one of the longest-running clients has been Emulex Corporation, a networking solutions provider focused on the convergence of Fibre Channel and Ethernet. One of the company's system engineers, Thomas Jones, has caught the social media bug in a big way, getting deep into blogging, Twitter and podcasting. You can find him at @niketown588 and http://www.niketown588.com. A week or so ago, he kindly took the time to talk with me in a wide-ranging conversation that covered not just social media tips and missteps, but blogging strategies, the ongoing debate of iPhone versus Android, and more personal questions, ranging from family to fantasy football. This laid back, but content-rich podcast, can be found on his Web site in two 30-minute parts, or below in full. His soothing demeanor and friendly style make for good background listening if you want to hear about everything from Sonos to iPad, Mario Kart and TweetDeck. TextPlus 4 Brings Personality, Pictures to "Boring Old Text"
Even if its not the most flashy of activities to do on your phone, chances are you are texting. Fully 72 percent of cell phone owners in a recent report from the Pew Research Center said they send or receive texts, so the common perception that texting is a feature monopolized by teenagers and other youth can be thrown out the window. But texting isn't that exciting, for the most part. Characterized by shortened phrases and cutesy emoticons hammered out on feature phones, it's no wonder you never see text in a commercial for the latest Android or iPhone. What's missing with text is context. It's a major reason why texts and e-mails and chat are so often misinterpreted, as you can't see the look on the person's face, or hear the tone in their voice. But TextPlus, who I mentioned in July when they added their support for communities around text topics, is looking to bridge that gap, bringing one of the most appealing features of Apple's new iPhone 4 (FaceTime) to text in a feature they call Face Texts - as part of TextPlus 4 for iPhone and the new iPod Touch (which has a camera). The concept, like FaceTime, is simple. Just like FaceTime took a known medium (videoconferencing) and made it personal by not only making it simple on a one to one basis on the iPhone, but also tugging at one's emotions with a pointed series of commercials, TextPlus is moving emotion into text. With Face Texts, every text between friends contains a photo of you in that moment. No posing. No positioning. No makeup. Just you and how you feel as you send that text. Similar to Apple's PhotoBooth application, there is a 3-2-1 countdown, a quick flash and as Steve Jobs would say, "boom". Your photo is next to the text you sent. Have a long conversation with a friend? Expect the expressions to change, or you can change your face to best explain your mood. It could be the missing link between text-only and true videoconferencing. Drew Olanoff, director of community at Gogii, the company behind TextPlus, and a good friend of mine, also linked the idea behind FaceText to DailyBooth, the popular startup where you are encouraged to document and share your life with others, leveraging daily photos - but instead of a one-time shot through a computer, Face Text is you at an unrehearsed point in time, through what he says is the "best social network in the world - the one in your pocket." The new TextPlus 4 works on iPhones, the new iPod Touch, and actually works well on iPads too, but you'll have a really hard time trying to find a camera on any of the current iPads out there, so if you want to Face Text, you'll have to pick photos from an existing archive in your collection and make do. But it's a lot of fun, and its personal - much more so than a simple string of text, a smiley face, and a lol for good measure. You can start Face Texting once you download TextPlus 4 at http://www.textPlus.com/download/. 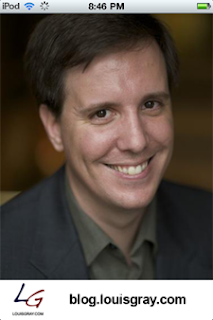 Disclosures: Drew Olanoff is CEO of Qwotebook, where I am an advisor. He is also one of my BFFs. Thursday night, I gained the opportunity to participate in the Android Guys podcast, ostensibly to talk about the launch of my6sense's new application on the Android platform, but the far-ranging call discussed the rise of Android vs. iPhone, the issues of privacy and next generation search. Starting at about five minutes in to the recording (below), you can see how these aggressively pro-Android geeks are seeing the introduction of the digital intuition and personal relevance app. In the discussion, they drill me on revenue questions, partnerships and how the Attention API could be used to surface relevant content from all streams. Hope you enjoy the discussion, which lasts about 20 minutes. There's no question the market for determining personal relevance is a hot one. In addition to my6sense, which you've no doubt heard a lot about from me on this week and last, one of the more interesting players in this space is The Cadmus. After debuting in November of last year as a real-time stream filter to eliminate duplicates, the company found a solid position determining personalized aspects of Twitter, including trending topics, which launched in February, and trends by list the following month. 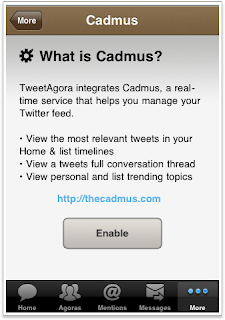 Now, the company is branching out with an API that lets other Twitter clients tap into Cadmus for personal relevance. If this sounds a lot like what my6sense is doing - that's because it is! my6sense introduced an attention API earlier this March at the DEMO conference, letting partners order all streams, from RSS to Twitter and Facebook, by relevance. With information overload being a serious problem for most active social networkers, and few content sources and clients doing much more than offering streams ordered by chronology, there is clearly a gap to be filled. Cadmus is also teaming up with a lesser-known Twitter client called TweetAgora to raise the visibility of the good stuff while hiding the rest. TweetAgora highlights the opportunity as "Find the goods." and "Filter the junk. ", including muting tweets by keyword, muting individuals, conversations, and blocking specific services, including Foursquare, Gowalla and Formspring. Muting individuals has been closely associated with Twitter client Brizzly, from ThingLabs, and SocialToo, Jesse Stay's company, who I advise, also offers the option to mute or unfollow people by keyword, and to unfollow people based on the service used to update Twitter. 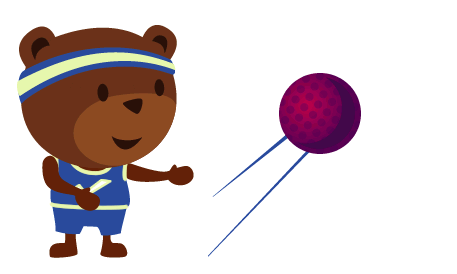 Cadmus' ability to launch an API with an active partner is a solid start, and the company is actively seeking out partners. You just might hear about some of their news tonight during an event with Seesmic. To download TweetAgora, featuring Cadmus, head to the iTunes store here. Disclosures: I am vice president of Marketing at my6sense, an assumed competitor of The Cadmus. I am also an unpaid advisor to SocialToo. Cliqset is the most feature-rich site aggregator on the planet, pulling in content from more than 80 separate Web services, going way beyond Twitter, Facebook and Google Buzz, and acting as an unsung pioneer of open standards, especially around data portability, identity and speed. The amount of data flowing into Cliqset has now reached a tipping point whereby creator Darren Bounds is opening up a searchable database that finds trends and information across the entire system, not just one service at a time. The idea? A broad social search that any brand or curator can tap into to see what is happening across the real-time Web. The new Cliqset Social Search is similar to that long offered by FriendFeed, which, once the deepest and most broad real-time search engine, has now atrophied since its acquisition by Facebook, not only not getting new features, but seeing sporadic uptime. But the service goes a step further in having a dedicated site focused on searching deep into content shared on these separate networks, rather than just burying it inside Cliqset itself. Now, should you choose, you can skip right on past Twitter Search and do so on Cliqset instead, seeing a true real-time flow of mentions, keywords, brands and whatever else is happening on the Web. 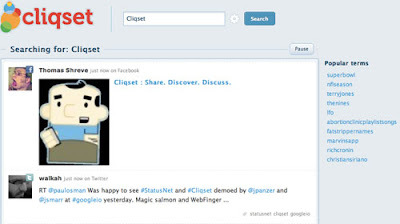 As with Twitter's well-known "trending topics", Cliqset Social Search displays "popular terms" that are trending in the different social networks. 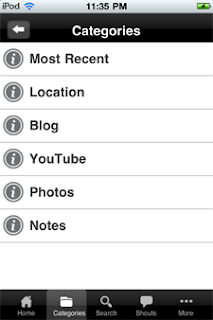 And you can search across any of the individual networks, or more than one, by choosing the checkboxes. This way, you can search just Facebook or Google Buzz, if you like, and skip Twitter altogether, should you be looking for more signal and less noise. If there are holes in the new Cliqset Social Search, I found that the recency of the item being discovered didn't always correspond to the time the item was shared. For example, a TechCrunch article posted in March came up as "2 minutes ago", presumably because that's when Cliqset found it. But it's better to find content than not find anything at all! The opportunity for data mining social networks is obvious. That we haven't gotten a perfect solution for searching Facebook outside of the network, and Google Buzz hasn't made external searches easy is unfortunate. But we know the world online is much bigger than just Twitter, and Cliqset gives us a start to dive deep into these multiple content repositories to find just what people are saying everywhere. Additionally, for Cliqset users, when logged in, you can interact with the content, including commenting, curation, replies and shares, said Darren. This is clearly another way to get more users into the site, which recently found itself hit with an invasion of signups from Turkey, and remains popular outside the United States - even if most people are having a hard time seeing beyond Twitter and Facebook, to try new social networks with interesting capability. Of note, you don't have to search to find my account on Cliqset. I am here: http://cliqset.com/louisgray. When I switched from iPhone to Android, there were few applications I missed. While some other switchers have lamented a number of high-profile games, for me there were only a few gaps - namely Cinchcast and my6sense. With Cinchcast reaching Android in June, my6sense was the lone holdout. And if you thought I would join a company whose products weren't available for me, you'd be nuts, so my6sense playing well with my HTC Evo was a clear inevitability. What wasn't inevitable about the app's reaching Android was the speed of its development, and its quality. As evidenced by the solid press coverage and user feedback at the conclusion of day one on Android, my6sense is filling an important role in the expanding Android market, cutting through information overload, while at the same time, unifying the different streams of Facebook, Twitter, RSS and Google Buzz. If you were watching my Twitter stream today, or my shares from Google Reader, which hit both Buzz and FriendFeed, you could see that my6sense's entry on Android struck a chord with a good number of people who have been waiting for the application to graduate from the iTunes application store and hit more screens. Even as it was rolling out to Android, the calls are clear that users are begging for my6sense's personalization and prioritization functionality to debut in new places - on the Web, on iPad, and to support new sources, for example LinkedIn, Foursquare and YouTube. Being in the marketing role doesn't mean I hold too much sway over the company roadmap and I can't do a lick of code, but be sure we're listening. If it were up to me, the power of my6sense would be everywhere, sorting and prioritizing every stream and every Web page just for me - like an intelligent assistant who finds the best and disposes of the rest. Like any new piece of software, there are bugs. I encountered quite a few during my own testing and saw many good rounds of updates in the weeks preceding the announcement. More were reported and being worked today. The service even went down on Tuesday morning following the initial launch as demand became overwhelming and new users flocked to the system. It's not ideal, but a situation many of us have seen, from small startups like Flipboard to larger pieces of our ecosystem, including Twitter. Even if I am on the odd side of the bell curve in terms of how I consume content, I use my6sense to surface the most interesting items from any source and put them squarely in my view. I also use my6sense as a powerful sharing tool to add items of interest to streams like Twitter and Facebook. But it's always good to hear others see the value. "There are so many great things that make up my6sense that I honestly could spend a thousand words talking about them," adding, "...it takes a day or so for the application to start to learn about you. After the second day, you’ll be surprised by what it pulls up. After the fourth, it will amaze you." "My new favorite Twitter app is my6sense. It's also my new favorite Facebook app. 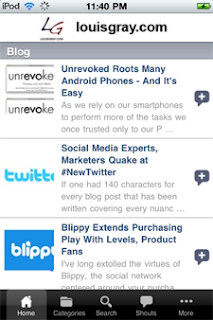 And my new favorite Google Reader app, and my new favorite Google Buzz app." "It's not hard to imagine places where the my6sense API could help. Wouldn't it be nice if you could come to a site like ReadWriteWeb or the New York Times, for example, and just see the stories that would be of interest to you?" In addition to those great quotes, my6sense was covered by a good array of tech enthusiasts, including TechCrunch, Android And Me, VentureBeat, BetaNews, Mobiputing, Robot Briefs, Technologizer, and GigaOM. Of course, with great visibility comes great responsibility. Like with Flipboard, you can't claim victory on one day's good buzz. The success will be measured through customer satisfaction, use and expansion through partnerships that recognize real value. Despite more than a decade's time in marketing roles for technology companies, I am not one who is keen on superlatives. I prefer to let the products speak for themselves. If you are an Android user who hasn't yet tried my6sense, it would be great to get your feedback. And if you use an iPhone or an iPod Touch, or even an iPad, my6sense is a solid contender to harness your streams and make them less of a mess and more personal. I'm spoiled because I know what my6sense can do, and I want it everywhere. I am excited to get the chance now to share it with the fast-growing Android community who needs more and more high quality apps. Add one more to the pile. You can find the new app at http://bit.ly/m6sandroid for Android and for the iOS platform on the iTunes store. When you find issues, let us know. If you have recommendations, let us know. This is only the beginning. Disclosure: I am the vice president of marketing at my6sense, which is also a Paladin client.